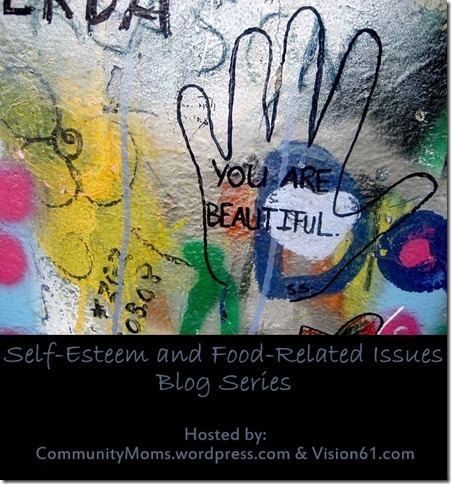 Angel at Vision61.com and Lisa Brown at CommunityMoms.wordpress.com – will be starting a series about Self-esteem and Food related issues. This series will start June 1st on Monday! We have a wonderful group of writers who will be sharing their stories with us. Stories to encourage and give us hope that God will pull us through. Through the rest of May we will be introducing these writers to you! So check in with us on Mondays. Today I would like to introduce you to Grace who has offered to share her story with us. You can find out more about her at the end of our post. I have always struggled with my weight. Thanks to hypothyroidism, weight loss and management is a constant uphill battle. Combined with OCD tendencies, and you have the recipe for anxiety, poor body image, anger, and depression. Over the years, I traded off either fixating on my food or giving up and not caring at all. My OCD is very “all or nothing” and if I can’t do it right, I won’t do it at all. As a young adult, I topped out at my heaviest just before meeting a personal trainer who changed my whole lifestyle. Sixty pounds melted off with better eating and a grueling exercise regimen. I was elated! I wasn’t a lost cause! The program was effective, but it resulted in a time of being so fixated on the “right” things to eat that I became disgusted and even fearful of certain foods. I was afraid of gaining again, and so my OCD took over and I was obsessed with the “correct” way of eating. I was reading labels constantly and always doing math in my head to track grams of protein, carbs, fats, and overall calories. It was working, but my anxiety level was increased substantially. I would later discover there was a word for this: “orthorexia”. When I was pregnant with my first, I gained forty pounds. Twenty pounds remained after the pregnancy. Since I was nursing, I gave myself permission to eat whatever I wanted, yet the scale stayed mostly the same. I then decided that if eating “right” had the same results as eating “wrong” then I might as well give up and eat what I want. The next few years were a blur of motherhood, another pregnancy, and the perpetual anxiety about my weight and what I was eating. During this time, I was diagnosed with Hashimoto’s Thyroiditis and PCOS. I was given new dietary recommendations by my doctor, which of course I followed to the letter. Just like the last time, I found myself obsessing and counting and keeping track of every morsel of food I ate. I used an online calorie counter, weighed myself almost daily, read every label, and one time broke down in tears in the middle of the grocery store. The stress was overwhelming! Each time it was a new way of eating, but the same story: I’d be eating “perfect” for a while, things would be working, but then vacation, staying with a relative, or birthday parties would come up, and I’d find myself binging on food I knew wasn’t good for me. It was my fixation on what I couldn’t have that resulted in binges. I had so much pent-up anxiety surrounding my food that I felt an emotional release when I ate the “bad” food. Up went the scale, and up went my anxiety, frustration, and anger with myself. You can see the ups and downs I experienced—both on the scale and in my mind—by being fixated on food. That’s no way to live. God gave us food to enjoy. But by focusing on what the world deems as “correct” eating, or what they consider a “good-looking” body, I was not glorifying Him in my thoughts. I was obsessed with “correct” eating, and it was making me miserable. I was perhaps a little thinner, but I was an emotional wreck. Scripture tells us not to be anxious over the things we eat or the clothes we wear. To me, this is not limited to monetary provision. This is not just addressing where the food and clothing come from, but also which foods I choose to eat, and what size I wear. Yes, I strive to honor His temple by eating healthy. But I do it in a way that is sustainable, realistic, and can last a lifetime. What use is the perfect body if your soul and spirit are in anguish? I choose to glorify and honor Him by giving Him that burden and trusting that He will sustain me. This is not to give myself license to eat poorly and not care what happens to my body, but to give me the strength to do what is right for my body out of love for my Creator, rather than become stressed, anxious, and fearful over my food, size, and body. When at last I fixed my eyes on Him, letting go of my burdens for Him to carry, it was then He was able to sustain me, and free me from food fixation. Grace is a wife, homeschooling mom, doula, pastor’s kid, and writer. She currently resides in southern Oregon with her husband and three gorgeous children, where they enjoy walks in the woods, wading in the river, reading good books, and attending a diverse and compassionate church.